To send one email to all Commissioners, click here. They say a well-oiled machine runs smoothly. Teresa Elmore has been helping the machinery of local government run smoothly for more than two decades. Teresa started as an administrative assistant in the Planning Department in July 1986. She was appointed by the New Hanover County Board of Commissioners to fill the role of Clerk to the Board in 2014 after 23 years as deputy clerk. Teresa is responsible for preparing minutes of board meetings and maintaining the official and permanent record of board actions. 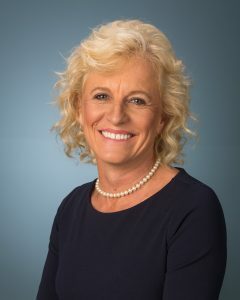 She also manages the office of the governing body by providing administrative support for five commissioners, responding to requests for information from the general public, and administering the recruitment of citizens to county advisory boards and committees. In 2004, Teresa organized and performed much of the work involved in digitizing board minutes dating back to 1864. This project established, and continues to provide, an improved research and retrieval process of board minutes and actions for citizens via the Internet. Teresa attended classes at both Cape Fear Community College and the University of North Carolina Wilmington. She is a member of the North Carolina Association of County Clerks and the Cape Fear Council of Governments Clerks Forum. Teresa is a graduate of the New Hanover County Master Gardener’s Association program and enjoys gardening and cooking.